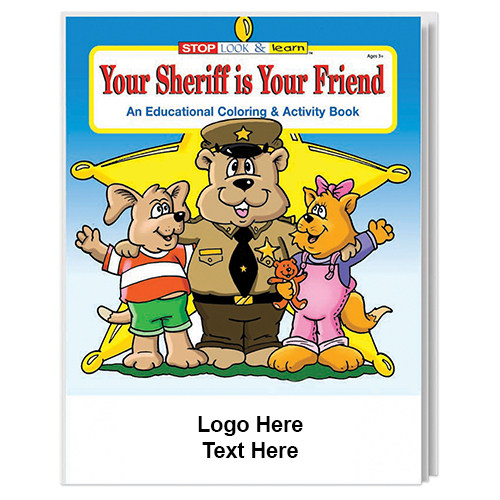 Promotional Your Sheriff is Your Friend Coloring & Activity Books are one best way to introduce kids to the activities and services of local sheriff. Ideal as handouts during field trips, safety classes and police station tours, these custom watercolor paint coloring books are having a total size of 8” x 10.5” and consist of 16 pages. The 7" x 1 3/4" imprint space showcase your brand exceptionally by the time the kids enjoy drawing and learning from easy to grasp messages. Order these custom products for kids quickly to get free artwork design and free online proofs services. 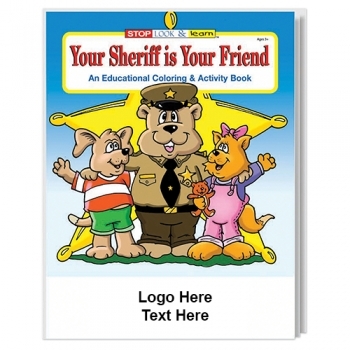 Request a quote to know the value savings that you can avail on bulk orders of Promotional Your Sheriff is Your Friend Coloring & Activity Books.